“Ice is civilisation!” declares Allie Fox, a mad inventor who abandons the train wreck that he firmly believes is the U.S.A for a new life in the uncharted nether regions of Central America. 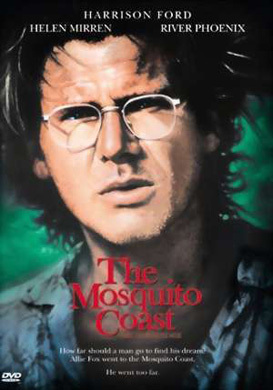 With the blueprint for his ‘Fat Boy’ ice-making machine secreted away in his luggage, Allie (Harrison Ford) uproots his family and heads off on a cargo ship bound for the titular Mosquito Coast. Also onboard is the evangelical Reverend Spellgood (Andre Gregory) and while he doesn’t yet know it, Allie’s destiny will be forever tied to this righteous man of the cloth. Australian director Peter Weir’s screen adaptation of Paul Theroux’s novel features Helen Mirren as Mother Fox and Butterfly McQueen (who played the O’Hara House servant in Gone With the Wind) as Mrs. Kenwick. Narrated by Allie’s eldest son Charlie (River Phoenix) the film starts on an upbeat note but unfurls like a feverish nightmare. At first Charlie regards his dad as nothing short of a genius but his sentiments soon begin to fester. After travelling upriver and setting up a self sufficient colony at a no-horse town called Jeronimo, Charlie and his brother Jerry (Jadrien Steele) follow their father into the humid heart of darkness to show the natives a block of ice. But when their prize melts into nothingness, Allie unleashes his frustrations on them. There have been other films about visionary men who go troppo in the jungle – Herzog’s brilliant film Fitzcaraldo immediately springs to mind – but there’s something seriously unsettling about this man, especially when he lies to his family about there having been a nuclear holocaust in their homeland preventing them from ever going back. His racism towards the local people whom he calls “savages” is also rather alarming. But his unbridled hubris will be his final undoing.